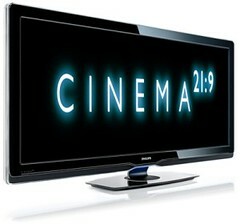 Philips introduced its widescreen Cinema 21:9 LCD TV. That the first cinema-proportioned 56″ TV incorporates Ambilight technology. Since there is a lot of movies with 16:9 ratio it’d be interesting to know how Cinema 21:9 will handle them. According to producer it shouldn’t be a problem. It will accurately match “on-screen content to extend the picture beyond the confines of the screen”. Philips promised to start selling Cinema 21:9 in Europe that Spring. The price and detailed spec are not available at that moment.